Westlink and Sons Of Bourke are off to the $500,000 Newhaven Park Country Championships Final at Royal Randwick after finishing first and second in today’s Western Region Qualifier at Dubbo. 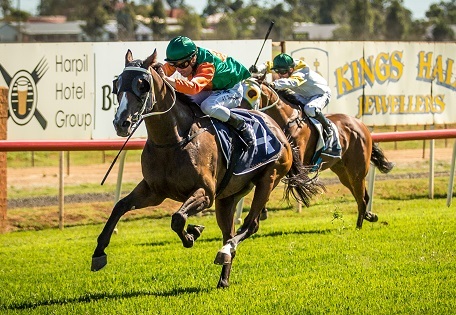 Local trainer Darren Hyde had a career-best day at the track when Westlink burst through the centre and drew away to win the $150,000 race by more than three lengths. “I’ve won a Bathurst Cup, that was pretty special, and a Murrumbidgee Cup but this today is something else,” he said. “To do it on your home track, in front of your friends and family is really special. Going into the race Darren was quietly confident his charge would be a strong chance despite the unwavering support for A Martin Placepick, who wasn’t disgraced in fourth. Sons Of Bourke (Andrew Banks) ran home strongly from midfield to finish second for young Dubbo trainer Clint Lundholm and an ecstatic group of owners from Bourke who bred and raised the horse. The Country Championships was the cherry on top of a sweet day for Hyde who trained a treble. Winona Costin got the stable on the board in the second race of the day, piloting Bedtime Stories to victory before Andrew Banks saluted aboard Tokyo Bullet in race six. “Tokyo Bullet is a smart horse,” Hyde said. Port Macquarie hosts the Mid North Coast Country Championships Qualifier next Sunday, 17thFebruary.